Join the Big Sky Documentary Film Series and Bob Ward’s for an outdoor screening event on Friday, September 14th at the Bob Ward’s store in Missoula. The screening will feature epic new documentary film ‘Mountain,’ a breathtaking spectacle that explores our captivation with the mountains featuring awe-inspiring footage of peaks from Tibet to Norway to Alaska and the skiers, climbers, bikers, paraglider and others who seek to reach their summits. The screening begins after sundown around 8:30pm but the party starts early with drinks, food, and a trunk sale with special deals on popular brands and outdoor gear. A beer and wine bar provided by The Rhino and food from local food trucks open at 4pm. 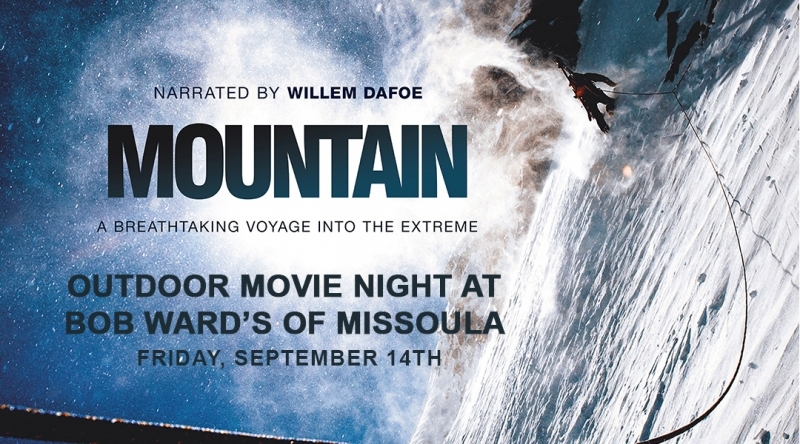 Bring your own lawn or camp chair and reserve your vantage point early to see ‘Mountain' the film as evening fades to night in Missoula.